Make Your Own Lampshades! - It's Fun and Really Easy! It's Fun & Surprisingly Easy! Are you in need of well-crafted, affordable lampshades? Want as much control over your lampshades as you do the rest of your home decor? 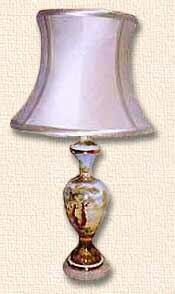 Can't find shades appropriate for antique and vintage lamps? 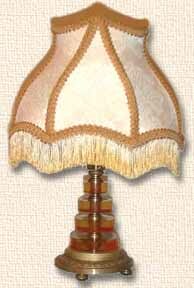 Wish you could restore your lampshades, rather than replace them? 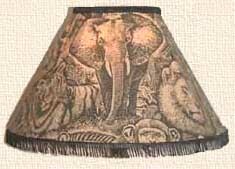 Are you a lamp maker, antiques dealer, lighting or other designer in need of the right shades for your lamps? Or an interior decorator, seamstress, upholsterer, shop owner, or someone else who could be offering lampshade restoration, custom-made shades, and/or original creations to your customers? Are you an artist, crafter, sewer, or anyone who'd enjoy acquiring a highly practical skill, while providing lampshades for the many naked and badly dressed lamps in this world? Maude's Lampshade Crafter's Handbook is an e-book offering detailed instructions on how to make professional-quality, fabric-covered lampshades, using traditional, sewn construction methods. Included is how to make lined, stretch-style lampshades, as well as Victorian, Art Nouveau, Art Deco, hexagon, and other panel-style shades. Please see below, if only interested in making paper and/or plastic hardback shades. These step-by-step how-tos were written with all ability levels in mind and include lots of troubleshooting and tips along the way. While this appears to be a craft that requires a lot practice, especially to get good enough to make a professional-quality shade, it's really quite easy. The shade on the right side of the banner, the Victorian-style shade, below, and several other shades displayed around this site were first-time projects. All it takes to create unique and wonderful lampshades is great fabrics and trims, and the willingness to give it a try. The focus is on the basic techniques, giving you the ability to look at any fabric-covered lampshade and understand how it was made. Unlike how-tos offering specific projects requiring specific materials, the frame, fabrics, and trims are all up to you. The construction methods remain the same. And this highly practical skill is not only surprisingly easy to get good at really quickly, but silk and fabric painting and dyeing, fringe, tassels, and other beadwork, embroidery, crochet, and other needlework, stenciling, and other art and craft techniques, along with embellishments galore, can be beautifully applied. For artists this is a new way to stretch a canvas, and for crafters and sewers, a new application for other talents. Only basic sewing skills are required! And for those with little or no sewing experience, I've included a Sewing Primer that provides everything you need to learn how to sew well enough to make soft shades (and a lot more). If looking for what you think would be a quicker and easier glued method of construction, not only is sewing much longer lasting, but more likely to lead to success, with far less risk for frustration and ruined materials. If you think you can't learn how to sew, see the box on the first page of the tour. 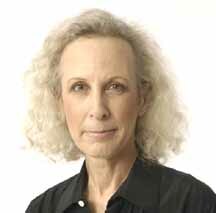 The lampshade on the left side of the banner was Lisa's second shade, and she'd never sewn a stitch in her life before making her first shade (see Unsolicited Testimonials). Stretch-style lampshades do require a sewing machine, but how to buy and use a sewing machine (just another kind of power tool) are included in the Primer. 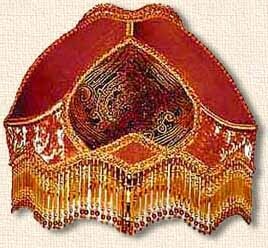 However, Victorian and other panel-style shades are hand sewn (with the neatness of your stitches not mattering one bit), and this same technique can also be used to cover any free-standing frame. Maude's Lampshade Crafter's Handbook also includes chapters on Making Money Making Lampshades, Recycling and Lampshades (with my secret rust remover recipe), and Lampshades in General. Please Take the Handbook Tour, where along the way you'll find more examples of fabulous, fabric-covered lampshades. (Lampshades in General is only linked to here, the rest, including the Sewing Primer, are included on the tour). The technique used to cover this stunning lampshade in velvet and brocade also works with any free-standing frame and most fabrics. Membership in The Shadecrafters Club gives you access to our private club site where you'll find an extensive list of supply sources for frames, fabrics, trims, all sorts of decorative embellishments, paper and other hardback supplies, craft and art supplies, lamp parts, and a variety of other resources that apply to far more than lampshades. There's also a separate discussion board that provides a place to ask questions and discuss a variety of topics. I know you'll find the club a valuable enhancement to your shadecrafting experience. See The Shadecrafters Club page for further details and other benefits. Hardback lampshades are made with plastic or paper, and include ring-style shades, hexagons and other angular frames, and 1950s-style shades. I've spent a lot of time trying to solve various issues related to the hardback supplies, particularly with the polystyrene film most commonly used for this purpose. Although hardback construction instructions aren't yet included in the book, they should be done soon. However, for those who already know how to make these shades there is a list of hardback supplies on the club site, as well as several good tips (see FAQs for a bit more on '50s fiberglass shades). If you buy the book now, you will also get the hardback chapter, as a separate download, at no additional charge. Book files are delivered by e-mail (alternatives availble on requrest) within 24 hours of making payment (though usually much quicker). For computer and/or printer-related issues, or other unanswered questions after taking the tour, please see FAQs. My Guarantee Because this is an e-book and can't be returned once downloaded, I don't offer a money-back guarentee, but I've sold more than 5,000 copies of this book and to my amazement have never had anyone ask for a refund. Instead, my guarantee is that you will learn how to do this even if I have to talk you through it, though beyond the occasional question, so far, this has never been necessary. Be sure to see Unsolicited Testimonials if you have any doubts about your ability to learn this swell craft, and FAQs for answers to the most common questions.